It can be beneficial for a bird to leave its nest before it can fly. Here, a Red-winged Blackbird fledgling takes one of its first forays into the world, and out of its nest. Photo by Thomas W Gorman via Birdshare. It’s to some young birds’ advantage to leave the nest as soon as they can. People tend to think of nests as safe, cozy little homes. But predators have a pretty easy time finding a nest full of loud baby birds, and nests can be hotbeds of parasites. Parent birds work from sunrise to sunset every day to get their young grown and out of the nest as quickly as possible. 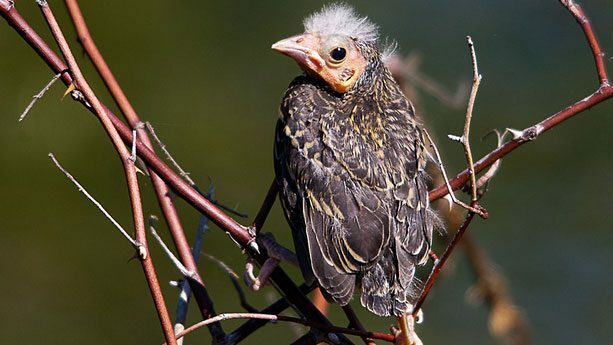 After fledging, the young birds are more spread out, and the parents can lead them to different spots every night, enhancing each one’s chances of survival. 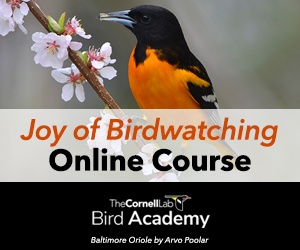 During this vulnerable time, you can help young birds by making sure your pets are indoors, or closely monitored when outside. Other young birds may stay in their nests until they are capable of flight. Species such as swallows, woodpeckers, and other cavity nesters nest where there are no nearby branches for young to awkwardly grab onto when they first leave the nest. Unless startled by a predator, young of these species tend to remain in the nest until they are strong fliers. If you think that a baby bird may have left the nest prematurely, check out our FAQ I found a baby bird. What do I do? for more information. After birds leave a nest, can I clean out the nest for future use? How long do birds incubate their eggs and how long do chicks stay in the nest?